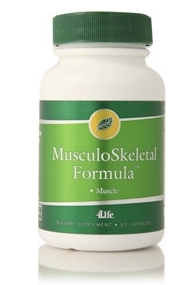 MusculoSkeletal Formula provides nutritional support to both the structural system and eliminative organs of the body. The herbs in this product have been historically used as blood purifiers, helping to move metabolic waste and other toxins in the blood from fatty and connective tissues into the liver and kidneys, where they are eliminated from the body. The ingredients in this formula also nourish the marrow, supporting the body’s role in producing normal red blood cells. The herbs in this product have been historically used as blood purifiers, helping to move metabolic waste and other toxins in the blood from fatty and connective tissues into the liver and kidneys, where they are eliminated from the body. The ingredients in this formula also nourish the marrow, supporting the body’s role in producing normal red blood cells. I use ARC and MusculoSkeletal and I benefit from them. My joints are moving more freely. I would recommend these products to anyone with muscle and joint problems.